Architectural design sites from Milan to New York are raving about a new residential tower proposed for Toronto, Canada. 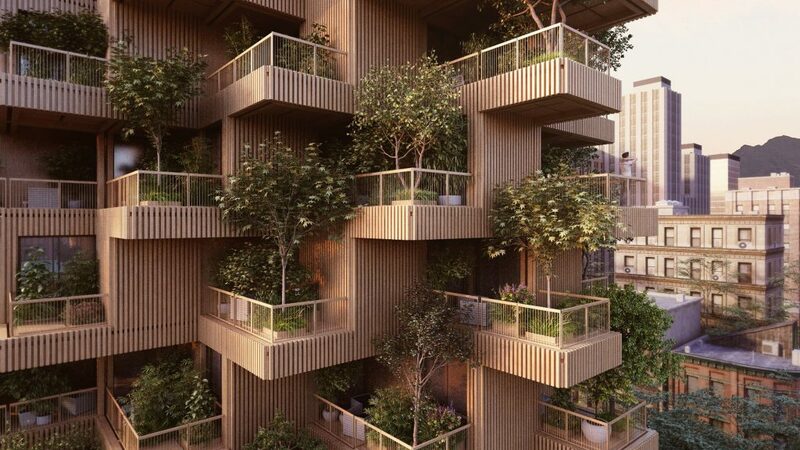 The 18-story residential block will be made from cross-laminated timber (CLT) and will feature tree-clad modular balconies so that the tower resembles a vertical forest, reports Dezeen, an architecture website based in London. According to Archdaily, the 18-storey tower will reach a height of 62 meters (203 feet) and will comprise over 5,000 square meters (53,800 square feet). The majority of the tower (4,500 square meters) will house residential units, while 550 square meters (5,920 square feet) will be dedicated to public areas including a cafe, a daycare center and community workshops. “The warm, natural appearance of wood and the plants growing on its facade bring the building to life and that could be a model for environmental friendly developments and sustainable extensions of our urban landscape,” he adds. The tower’s pre-fabricated CLT units would be assembled off-site, then delivered and stacked onto the foundations around the central core. Afterwards, wooden facade panels would be installed and sealed. Large outdoor terraces will support large vegetation systems capable of supporting food gardens, shrubbery and even trees, all of which will help to passively cool the building and offer privacy to teach of the units. By placing trees directly adjacent to the structural wood panels, the structure reflects a symbiosis of nature and built environment. The ‘Tree Tower’ will continue Canada’s pioneering efforts in timber-framed tall building construction. It also takes advantage of the significant credits (10-20 per cent of total funding) made available by the Canadian government for projects exceeding certain carbon footprint standards. In 2016, the AFR reported that Australia’s first CLT production plant would open at Albury-Wodonga in 2017. The $25 million plant operated by New Zealand timber company XLam is expected to produce 60,000 cubic metres of CLT annually. Marketed as the building material of the future, CLT is as strong and fire-resistant as concrete and steel and, as a prefabricated solution, competes with precast concrete on cost and time involved in construction. In Australia, the new material is only beginning to make its presence felt. The best-known examples are Lendlease’s 10-storey CLT apartment tower, Forte, in Docklands and proposed 9-storey office block in inner Brisbane, and Strongbuild’s 10 storey tower in Sydney’s Norwest Business Park ‘Circa’ precinct.